There is only one elevator serving the eleven floors in the physics department. This makes any trip from my 9th floor office to the Great Outdoors one to be considered carefully, since the wait time on the return journey can turn even the quickest trip to buy a soda into a day's expedition. On Wednesday, I had gone outside for two reasons: the first was that I was hungry and my computer monitor was starting to look like a large slab of extra dark Lindt chocolate. The second was that it was a beautiful afternoon and the rest of the week was forecast for nothing but rain. The rest of the week was also a national holiday. That, people, is what we call UNFAIR. On my return, I chewed on the straw of my grapefruit juice and waited for the elevator to make its round-robin way to the first floor. I was just regretting not purchasing more food (maybe dinner and tomorrow's breakfast) when the doors slid open to reveal a young man standing in the centre of the elevator. His phone was flipped open but rather than looking at the screen, he was staring at a spot on the floor just in front of my feet. Either the elevator had become a stasis chamber or its occupant was a cyborg. I almost didn't step inside. Then I realised that my hesitation might mean the cyborg knew his cover had been blown. No doubt he had been programmed to open his phone while updating, thinking this the ideal cover in a country where everyone is permanently glued to their handsets. YOU GOT TO LOOK AT THE SCREEN, MORON CYBORG. Yet another classic example of why computers won't take over the world. For others, see my published research. However, revealing I had discovered his ploy would undoubtedly result in alien abduction and probing and memory reassembling that would wipe my preparations for my next class and the whole thing would be in Japanese, so I wouldn't understand and therefore couldn't even blog about it! Besides, I was meeting representatives from a nearby high school at 5:30 and an abduction was bound to over-run. I stepped into the elevator. Time appeared to run normally. I flipped open my phone and tried to blend in. This was pointless since I had no signal while we moved. SEE HOW DUMB YOUR SCHEME IS, CYBORG BOY? After three floors, the cyborg looked up, then down again. This time, his eyes found his phone screen. I escaped on level 9. The cyborg continued going to level 11. Particle physics is probably history. There's another important question: What, if any, is the connection between the plant shop crow and the cyborg man? Could this be a nefarious plot? Transmogrification? Suspiciously, I did read a fantasy novel where the crows could turn into people... maybe this is why people like the snow in Sapporo. Less threat from CYBORG CROW MEN. um. you guys are feeding my paranoia. I regret reading this post. Just because you're not paranoid doesn't mean there aren't people out there to get you. 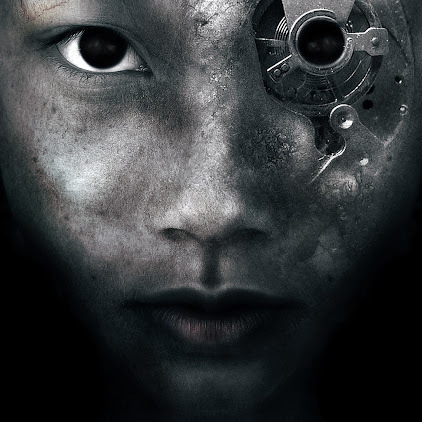 Also, if you were going to assimilate a nation, Borg-style, wouldn't you start with Japan? They're like, 3/4 of the way done. That's a brilliant line :) But it doesn't rule out the possibility that all mathematicians are actually cyborgs.